The term "chronic care management (CCM) services" has been buzzing through medical practices in the past few years. More recently it has become a critical component of the care we provide to our patients who live with multiple chronic conditions, whose management is often daunting. Between doctor visits, taking the right medications at the right times, and following advice from different health care professionals, managing chronic conditions can be overwhelming. 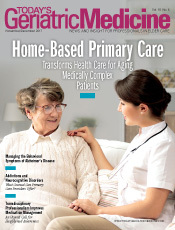 Those with chronic conditions, including older adults, can face care fragmentation, encounter discontinuity of care, and churn through multiple settings of care that are not consistent with their care goals despite well-intentioned attempts to meet their care needs. Similarly, geriatric health care providers have long desired a better way to provide the care and services that older adult patients want and need in light of these potential challenges. Through the Connected Care campaign, the Centers for Medicare & Medicaid Services (CMS) Office of Minority Health and the Federal Office of Rural Health Policy at the Health Resources and Services Administration are raising awareness of the benefits of CCM for patients with multiple chronic conditions and providing health care professionals with educational resources to deliver these services to patients in their practices. Incorporating and sustaining a CCM service as part of clinical practice takes time and effort. Recognizing this, CMS has established separate reimbursement using four billing codes to provide payment that reflects the additional time and resources spent to manage the care of Medicare and dual eligible (Medicare and Medicaid) patients with two or more chronic conditions, including time spent outside of the usual face-to-face encounters. The new billing codes can help pay for work done between appointments, such as care management and coordination for Medicare and dual eligible patients with multiple chronic conditions. Such services help patients stay on track with their treatment plans and stay healthy. With two-thirds of Medicare beneficiaries having multiple chronic conditions, CCM is of particular importance to patients who have health insurance through Medicare or both Medicare and Medicaid,2,3 which means many of the patients we see and treat every day may benefit from CCM. As a result of CCM, patients can obtain help planning for better health and staying on track. Encouraging patients to use CCM services will give them the support they need between visits, and having a regular touch point may help patients think more about their health and become more conscious of taking their medications. These services may also help patients feel more satisfied with their care and improve adherence to their treatments. For many busy physicians and clinician teams, implementing a CCM workflow can be challenging, but Connected Care is designed to help you provide these services in your practice. Through the website, clinicians can download the Connected Care Health Care Professional Toolkit to find information about eligibility to receive Medicare payment for CCM services, CCM service requirements and how to bill, experiences from other health care professionals, and resources to help in delivering these services in your practice. By offering CCM services, health care professionals can deliver the coordinated care their patients need and help patients stay on track by getting support between visits. For more information, visit go.cms.gov/CCM. — Ashby Wolfe, MD, MPP, MPH, is a board-certified family physician who currently serves as chief medical officer for Region 9 of the Centers for Medicare & Medicaid Services (CMS). In her current position, she focuses on implementation of Medicare and Medicaid policy and provides clinical expertise to many regional CMS programs and divisions, quality improvement, and outreach/education efforts in the region. She sees patients regularly as a family physician at Clinica Alta Vista in Oakland, California. — Shari M. Ling, MD, MSG, currently serves as the deputy chief medical officer for the Centers for Medicare & Medicaid Services and medical officer in the Center for Clinical Standards and Quality. Her committed focus is on the achievement of meaningful health outcomes for patients and families through the delivery of high quality person-centered care across all care settings. 1. Chronic diseases: the leading causes of death and disability in the United States. Centers for Disease Control and Prevention website. http://www.cdc.gov/chronicdisease/overview/. Updated June 28, 2017. 2. Centers for Medicare & Medicaid Services. Chronic conditions among Medicare beneficiaries. https://www.cms.gov/Research-Statistics-Data-and-Systems/Statistics-Trends-and-Reports/Chronic-Conditions/Downloads/2012Chartbook.pdf. Published 2012. 3. Multiple chronic conditions. Centers for Disease Control and Prevention website. http://www.cdc.gov/chronicdisease/about/multiple-chronic.htm. Updated January 20, 2016. Accessed September 9, 2016.